Being a bridesmaid can be serious work. Lucky for you we've taken the guesswork out of navigating this important role so that you can support your bride-to-be right up to her "I dos" without breaking a sweat. Your best friend has finally popped the question... the "will you be my bridesmaid?" question, that is. Now what? From scoping out the hottest bridesmaid dress trends to planning her bridal shower, running last-minute errands and offering both emotional and physical support (sometimes it takes two to get into a pair of heels while wearing a wedding gown! ), being a bridesmaid can be serious work. Lucky for you we've taken the guesswork out of navigating this important role so that you can support your bride-to-be right up to her "I dos" without breaking a sweat. Once a bride has selected the color scheme for her big day, one of the first things she'll do is explore how to infuse her chosen hues into the attire of her bridal party. 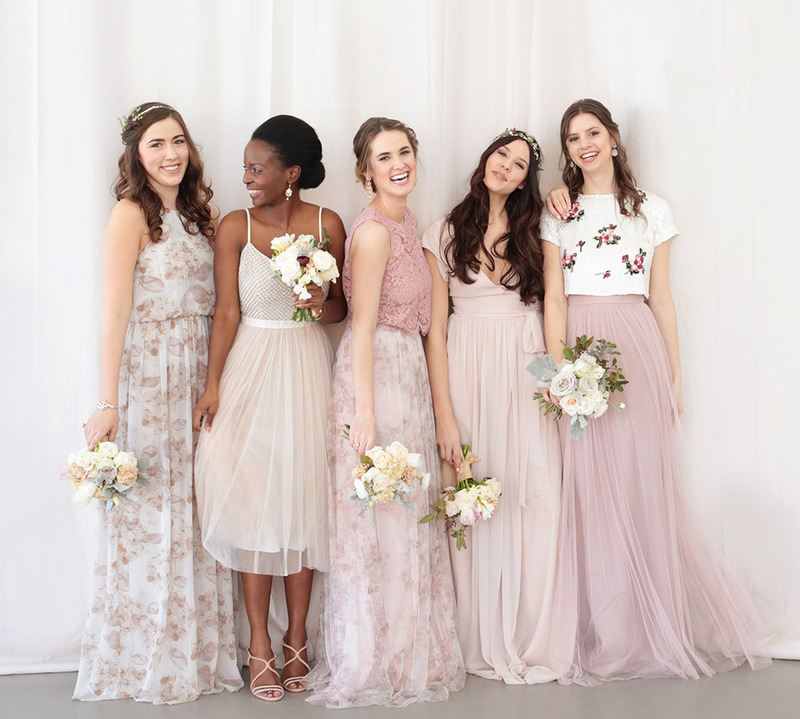 Whether it be with one consistent shade or variations of a single color, she'll search high and low for bridesmaid dresses that bring her vision to life. Put her mind at ease by suggesting mix and match options that work together to strike the perfect balance. If she's interested in a tonal bridal party, a la T.Swift's bff Brit Maack, stick with soft, subtle neutrals like sandstone and blush. With 14 bridesmaids to outfit, Brit turned to the experts at BHLDN to find a few different shades that added visual interest, yet felt cohesive as a whole. From the Fleur Dress in blush to the rose gold Sophia Dress and sand-colored Zola Dress, there are endless options for successfully executing this trend, all the while meeting the individual needs of your fellow maids. add dimension to the look. A mix of tulle, lace and of course, a bit of sparkle will create a textural richness. And don't forget, adding a print can be the perfect shout-out for the maid of honor! Add a little more shimmer with a sparkly sash or two and you're ready to step out in style. Did someone say #squadgoals? In addition to color and style, it's important to be mindful of diverse shapes and sizes when suggesting bridesmaid dresses. Try to choose silhouettes that are universally flattering or provide complementary dresses that can accommodate different figures. For instance, a fit and flare silhouette looks great on a variety of body-types. Trust me, both your fellow bridesmaids and your bride-to-be will thank you for keeping this in mind. Our favorite recent bridal party trend? Definitely the Solange Knowles inspired all-white look. When it comes to adding depth and texture to this blank, bridal party canvas, it's all about the accessories. They not only allow your 'maids to personalize their looks so that they feel comfortable and most like their everyday selves, but also help them to stand out in photos. Adding one "pop" per girl is the perfect way to achieve this without competing with your bride's attire. "Pops" can be colored or embellished shoes, a bold piece of jewelry or even a sparkling hair accessory. 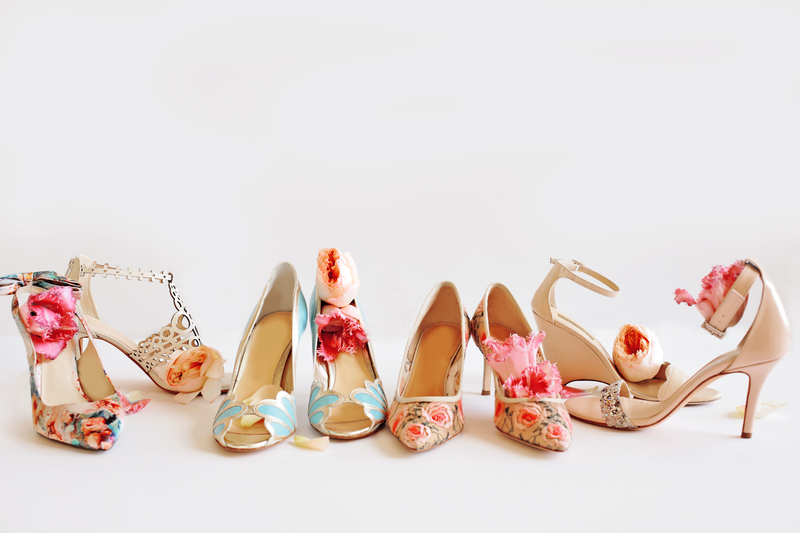 Right now, we're loving Rachel Mulherin's stunning handmade bridal party jewelry and, of course, BHLDN's Floriography Pumps and En Fleur Pumps (perfect for spring!). When it comes to planning pre-wedding parties, such as an engagement fete or bridal shower, get creative! You don't have to throw the same boring cocktail party or backyard bash that your bride has attended in the past. Bring both her and her groom's friends and family together for an evening of competitive bowling or take it to the kitchen with a fun, hands-on collaborative cooking class. For a "girls only" soiree, plan an intimate daytime picnic in the park (mimosas, anyone?) or host a sewing class in the comfort of your own home. Bra Making with Madalynne is an incredible new vendor that specializes in bra-making workshops, perfect for designing a little lacy set for her honeymoon! You'll want to pre-plan as much as possible so that your bride's big day goes off without a hitch. To help her and your fellow bridesmaids keep cool, calm and collected we highly recommend investing in Pinch Provisions Minimergency Kits. Chock-full of 21 wedding day essentials - including a deodorant towelette, hair spray, dental floss, safety pins and double-sided tape - this wedding day saver is compact enough to carry in the palm of your hand and thorough enough to alleviate any last-minute snafu. In addition to being proactive about what could go wrong, it's equally as important to be proactive about making everything go extra right. Take the initiative to surprise and delight your bride by pre-planning a little post-ceremony celebration for her and her groom, complete with champagne and sweet treats. The perfect combination: Le Grand Courtâge Cuties paired with personalized macaroons from Woops! . There's no doubt she'll be elated to have a fun, intimate moment with her new hubby before being whisked off for photos, socializing and dancing. Seeing her new last name for the first time on something she can eat is just an added bonus! Agreeing to be a bridesmaid is a great honor, but it definitely comes with a lot of responsibility, time and financial commitments and, at times, less-than-desirable stress. Follow these guidelines and keep in mind that the love between your bride and her beau is the reason for the celebration and you're guaranteed to walk away as the picture perfect bridal party.